The Templars need a hero! Join millions of other players in a glorious quest to save all of humanity or spend eternity in the depths of Hell. Are you the Iron Blade-bearing savior the prophecy foretells? o Defeat countless threats by battling possessed and demonic forces to complete the explosive story. o Immerse yourself in the rich history and fantasy of the Middle Ages — a legendary world where cold, hard steel meets elusive arcane powers. o Fight your way through scenic European landscapes to bring the light back to Notre Dame, defeat the undead hordes in Scotland, and banish the vampires in Transylvania. 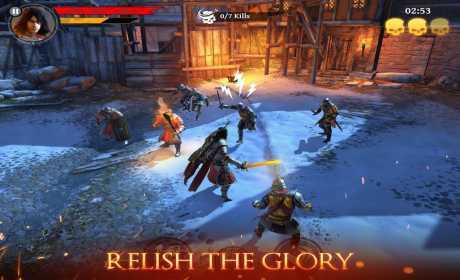 o Indulge yourself in our combat-focused gameplay, specially designed for mobile. Release your inner warlord! o Develop your own combat style: Link up taps and swipes to perform unstoppable combos that will crush your foes. o Amazing special attacks and finishing moves that end in decapitation, dismemberment and other mortal blows. o Unlock, manage and upgrade a variety of weapons and armor to best express your fighting style. 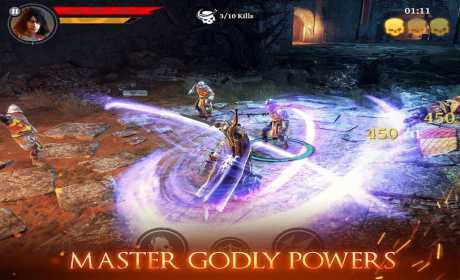 o Unleash devastating spells and skills on your foes. o Attack other players and crush their defenses to claim their resources. o Manage your domain resources and improve castle defenses to ensure better odds of keeping them safe. o Acquire and upgrade castle-defender units that protect your domain while you are away. 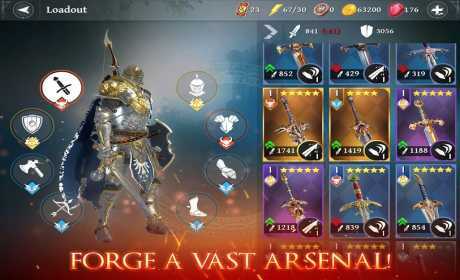 An epic game of medieval war, Iron Blade gives you the opportunity to be a young knight taking quest after quest and using his sword in a land of dark arcane magic, blood and glory. Face the horror of shadow after shadow, fight a war against dark monsters, explore every dungeon, and break the curse that has fallen over the kingdom! Save your sword and soul, protect humanity and clear the lands to keep from losing the war against the shadow kingdom! Be the hero everyone is waiting for — the hero to kill every monster, clear every dungeon, and fight every epic dark knight — in his quest for glory! This RPG is a game for those born with battle in their blood. Every soul awaits a hero… The king himself will grant you his sword and epic treasure if you fight and kill the monster that created the arcane curse that drains the blood of the kingdom. Take on this mobile RPG and fight your way through a game set in the epic halls of the kingdom. Don’t give in… As you advance towards the dark recesses of the dungeon and the epic fight against the soul shadow, stay true to your quest and become the RPG hero you’ve always dreamed of. Kill all the cultists struck by the curse, master the game and leave no evil behind. Take this chance to become king and rule your kingdom as a true hero. When we will have mod for this game ?